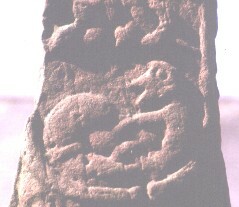 South view of Cross shaft, lower part, dated to the first half of the tenth century. At the base of the panel there is a creature, seen in profile, with pointed, open jaws, peaked forehead, and a round eye. His lower parts are interlaced with his arm.